Moving to Australia? Then you will need to open an Australian Bank Account. Moving from one country to another has its complications. Fortunately, one Australian bank can help smooth the way. For people contemplating a move to Australia, there's a lot to think about — from transporting your belongings, to accommodation in a new city, and all of the requirements of a new job. You also need to get your finances organised, whether that means opening a new Australian bank account, or looking for extra funds to cover the expenses that inevitably crop up. That's why the Commonwealth Bank has created an International Customer Services team to support people moving to Australia. Their fast, streamlined service helps you open up Australian bank accounts, credit cards and other accounts before you move, so that everything is ready and waiting when you arrive. They can also put you in touch with financial specialists who can help you with everything from insurance to investments. Please note, you can start the process now and save the details to complete at a later time. The form will only take 4 minutes to complete! Click here to start. In 2011, we have been named Bank of the Year, by Money Magazine, that makes it two years in a row! So you can feel reassured that your finances will be in great hands. Moving to a new country can be as stressful as it is exciting. But it doesn't have to be. Our aim is to help you set up your banking in Australia, before you leave, so it's as simple as possible. To assist you, we've created an International Customer Services team (ICS). We'll take the complexity out of opening bank accounts and transferring funds whilst you are still overseas. Why choose the Commonwealth Bank? With over 1000 branches and 4000 ATMs the Commonwealth Bank has Australia's largest retail network. The International Customer Service team is available 24 hours a day, 7 days a week so you can contact us at a time that suits you. The International Customer Services team speaks your language, with multilingual sales and service representatives dedicated to helping people moving to Australia. The team is the single point of contact for international customers so you don't have to know who does what in each area of the Bank – we look after all that for you. With a wide range of products, we can assist you with all your banking needs. Within 24-48 hours of submitting your application your account will be opened and you will be contacted with your account details. 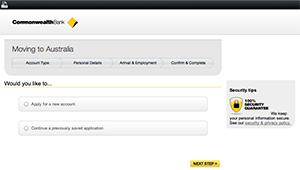 For more information Commonwealth Bank please visit our website: http://www.commbank.com.au/. We recently talked to some new arrivals to find out about their experiences. Here's what they had to say. "The experience was easy and seamless"
"I moved to Australia from New Zealand to further my career", According to the customer , moving has allowed him to broaden his experience and become involved in areas of medicine that he would have otherwise been unable to access. Before he moved, his bank arranged for a member of the International Customer Services Team to contact him and help him set up his new Australian bank accounts. "This was an easy process," he says. "I arranged all the set up over the phone." "A week before I arrived in Australia I transferred money into the account and the account was activated. I also was pre-approved for a credit card." After arriving in Australia, a brief visit to the bank was all it took to have everything up and running. "I went to the bank, collected my banking cards and signed several documents, and I was done," he says. Like many of us, the customer is time-poor, so speed and convenience were important to him: "All the hard work was done for me — that was especially useful since I lead a busy life." But cost savings also played a part in his decision to bank with the Commonwealth. "Another advantage of coming to Commonwealth Bank was less fees," he says. Another New Zealander, said she contacted the Commonwealth Bank to set up a new bank account before she left. "[The] process was extremely quick and easy," she says. "Everything can be done online." The International Customer Services team contacted her and took the time to understand her needs, then suggested services to match. "[I] wasn't expecting to be offered credit cards," she says. She was also "introduced to the NetBank Saver account, which was good for me." Asked how she would describe his experience, the customer says it was fast and easy — "[they] helped every step of the way." In fact, she liked it so much, she's recommended it to a number of friends who are considering a similar move. If you're planning moving to Australia, the Commonwealth Bank's International Customer Services team is ready to help smooth the way. Simply fill in the form to the right and you will be one step closer to your dream of living in Australia.